Eight years ago today I found this colony of horsemints (Monarda citriodora) flowering with some firewheels (Gaillardia pulchella) in Pflugerville. If you’re interested in the craft of photography, point 18 in About My Techniques is relevant to today’s picture. Your wild flowers are so fascinating, Steve! They are indeed. Texas is famous for them. There are so many Monarda species, I’m not always sure which I’m looking at. I found a small group last weekend, and think they might have been young spotted beebalm (Monarda punctata). Their complexity’s so appealing, and the size of this colony is amazing. I’ve never seen a colony like this, and I may not get the chance to see if the ones I found develop further. They’ve been mowing like crazy down at the wildlife refuge: so much so that it looks like the danged suburbs now. I don’t know the purpose, but it was depressing to see. They took developing fields of prairie gentian and eryngo down to the dirt, along with ditches filled with a variety of flowers. One of these days I may give them a call and ask about it, but I need to calm down a bit more before I do. I would definitely call. That happens here sometimes at our preserves. They mow wider and wider paths through the prairie, completely taking out rare plants. Idiots. But then someone calls and the mowing stops. It is usually just some moron who likes to mow, and can be stopped if the right person hears about it. Despite my pessimism, I do hope you’ll call and see what you can accomplish. Maybe you can get everyone in your NPSoT chapter to call individually and complain. It might be best to have people not identify themselves as NPSoT members, or else the authorities might consider all the separate complaints as a single complaint. Good thinking. It is surprising what effect making those calls can make. For sure, it is necessary to stay vigilant. There is something about putting someone on a riding mower that decreases his IQ significantly. I like the way you put that. As amazing as you may find this colony, you’ll have to imagine even larger ones I’ve occasionally seen around Austin over the past two decades. In checking just now, I found I’ve never shown one of those especially vast colonies. One reason is that the largest colonies date back to before this blog. Another is that the half-a-megapixel size I’ve adhered to here can’t do justice to all the details in pictures of the largest colonies. As for mowing, I long ago concluded, sadly, that there’s not much we can do about it. Anecdotally, I’ve observed that a large portion of the population shares the mentality in which a shorn lawn is the acme of perfection. I’ve had a few minor successes in intervening with the people in charge, but nothing lasting has come of it. I’m fairly certain I have seen these here, but not in such a group! Beautiful!! Fortunately for me, colonies of horsemints aren’t unusual here in May. I’ve sometimes seen significantly larger ones than this, even to the point of covering a field. I cannot get over the spectacular wildflowers you folks enjoy. Cannot imagine people mowing down such a sight. I did not recognize this as a relative of the beebalm, that one of my grandmothers always grew in her back garden. I read a bit about the plant, and about the botanist Monardes, all very interesting. If you walk through the patch, does it have a citrus aroma? As good as the wildflowers are here at times, historical records suggest that what we have now is a sorry fraction of how things used to be. I wish I couldn’t imagine people mowing down stands of wildflowers. Unfortunately, 20 years of observations have proved and re-proved the existence of a mowing mania. I don’t think I’ve ever detected an airborne aroma from horsemints. However, if I handle an inflorescence and then sniff my fingers, I do detect a somewhat citrusy scent. 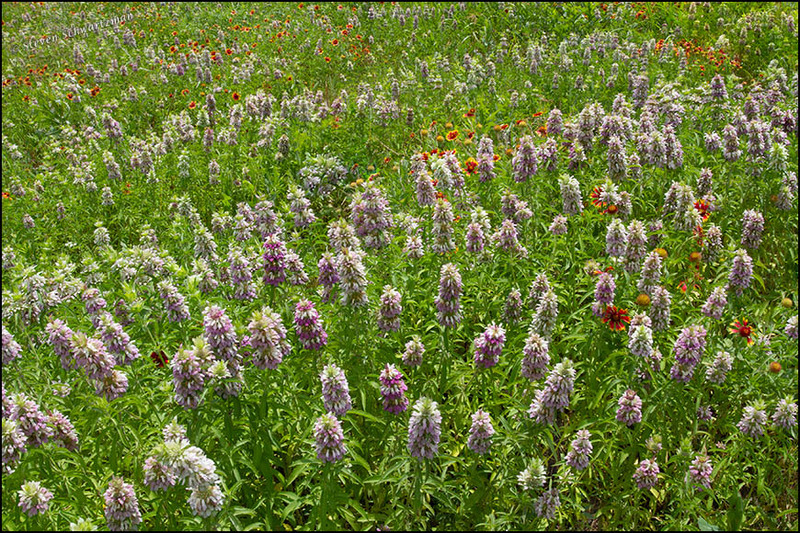 The name horsemint apparently comes from the fact that the scent reminded people in the 1800s of the smell of a wet horse—at least that’s what I’ve read. The comparison to the smell of a wet horse puzzled me, too. Maybe if I’d had experience with horses I could make the connection. By resisting “off with their heads,” you can keep Cornwall a Wonderland and Dodg[son] mowing for as long as possible.